For the past several years she's been writing shorter biblical fiction that sadly doesn't interest me as much. But for the first time in what feels like forever, she has a novel coming out in March! I am so excited especially as it looks excellent! Sounds absolutely amazing doesn't it? Can't wait to get my hands on it! PS It's 450 pages!!!! Isn't that WONDERFUL?!? PPS It's published by Tyndale! I love them!!!!! PPPS. No, I would not say no to an ARC! Thanks for the heads up about this book! I am glad it's a historical - her contemporaries have never "grabbed" me the way her Mark of the Lion trilogy, or the Biblical fiction, did. Sounds interesting. The synopsis reminds me of the book Eve's Daughters. Wow, I didn't realize she had a new one coming out. I too, can't wait to read it. I was wondering if she was going to come out with anything new anymore. I'm glad she is. 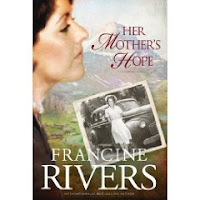 I look forward to a new book by Francine Rivers. I think that REDEEMING LOVE was the first inspirational fiction book that I felt was really well written. It made me take this genre seriously. I've only read one book by her, Redeaming Love, but was really impressed. Thanks for the heads up! This book sounds really good. I, too, have read Redeeming Love and the trilogy with the character Hadassah by Ms. Rivers. Very good books all. Oh! I just seen this post! I love Francine Rivers and have read almost everything she has written! I did not know she had a new one!